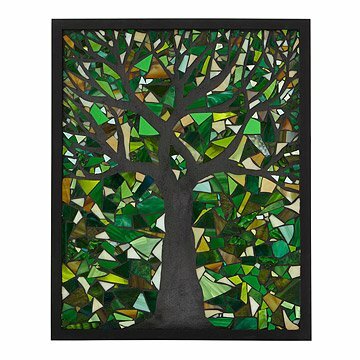 Chanda Froehle creates a mosaic landscape using a bright mix of recycled safety and stained glass and second-hand store finds. Chanda uses traditional techniques to hand cut the glass before she affixes the individual pieces to the frame. Hang or lean against your window to transform the afternoon sun into a glittering work of art. Simply lean against the window and enjoy the bright, changing display. Handmade in Kentucky. This is a stunning piece of art. It's the second piece that I have purchased from this artist, and both are beautiful and unique. They are worth every penny and make wonderful gifts.